The deep ocean is a scary place full of bizarre creatures and vicious predators. Although most humans will never personally encounter these creatures, knowing that they are down there is a little spooky. 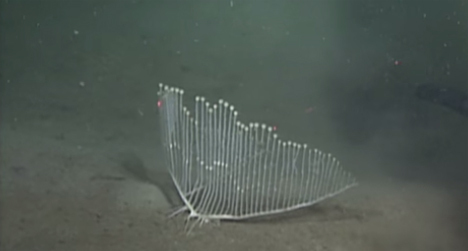 The harp sponge, discovered in 2012 by the Monterey Bay Aquarium Research Institute, is a rather beautiful organism, but its delicate appearance and musical name belie its sinister personality. The harp sponge is so named because its graceful physical structure is shaped somewhat like a harp. It has horizontal branches that support a number of vertical branches, each of which terminates in a swollen ball. All along the vertical branches are jagged hooks that the sponge uses to ensnare its prey. When an unsuspecting crustacean wanders a bit too close to the hooks, it will find itself hopelessly stuck in the sponge’s grasp. The innocuous-looking sea creature then forms a digestive membrane that surrounds the prey and dissolves it so the sponge harp can absorb the meal through its pores. Since there are few rocks in the spaces that the harp sponge occupies, it has developed root-like structures known as rhizoids to hold it on the soft mud-like sediment. Scientists believe that the sponge’s unusual fanned-out structure evolved over time to help it capture as much food as possible. 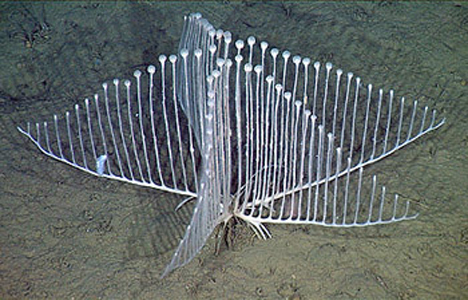 Some sponge harps have been observed with only two horizontal branches, but others have been known to sport as many as six. This physical framework, as well as the number of vertical branches, also helps the sponges procreate. The swollen spheres atop each vertical branch hold packets of sperm, which are released to float off to fertilize other harp sponges. Since the sponges are found in fairly deep waters – 10,800 to 11,500 feet – there aren’t strong currents to carry the seeds far and wide. The fertilized sponges are therefore usually quite close to the ones that released the sperm. When the seeds reach the host sponge, the the fertilized eggs form the swollen areas partway up the vertical branches as seen in the images above.